In this tutorial, we will learn How to create an object in Java with a simple example and programs which will be helpful to understand the concept of creating an object in Java. Can you think why we need to create an object in Java programs? Let's see first understand it. 1. Since Java is purely object-oriented programming language. So Everything is done in the form of objects only. Therefore, objects are required in the Java programming language. 2. To store data temporarily in Java application, we require to create an object. The object provides temporary storage for our data. 3. In Java, By creating an object, we can call the members of one class from another class. It is useful when we need to use common code in every class again and again. 4. To access members of any particular class, we have to create an object of the respective class. Whenever we create an object in any program, the Object reference variable is automatically generated. By using this object reference variable only, we can access the members of a particular class. The reference variable must have reference value. The Dot(.) operator gives you to access an object's state and behavior (instance variables and methods). These are the reasons for which we create objects in Java programs. There are several ways to create an object of a class in Java. They are as follows. In this chapter, we will learn using the new keyword to create an object of the class and another way we will learn one by one in the next tutorial. What is a new operator in Java? In Java, a new operator is a special keyword which is used to create an object of the class. It allocates the memory to store an object during runtime and returns a reference to it. This reference is the address of the object in the heap memory allocated by the new operator. This reference (memory address) is then stored in a variable called object reference variable that can be accessed from anywhere in the application. See below image. In Java, an object of a class is created using the new keyword in three steps. They are as follows. 1. Declaration of a reference variable. 2. Creation of an object. 3. Linking the object and the reference variable. A general form of declaration of a reference variable is given below. Classname object_reference_variable; // Creating a reference. The Classname is the name of the class which is being instantiated. The object reference variable is a variable of type Classname. For example, consider a class whose name is College and object reference variable myCollege. It can be declared like this. This statement tells the JVM to allocate memory space for a reference variable and names that reference variable myCollege. The reference variable is of type College. We can create an object in general form like this. The class name followed by parentheses represents the constructor of the class. This statement tells the JVM to allocate memory space for a new College object on the heap. Now, we will link the object and reference created above like this. Assigns the new College to the reference variable myCollege. College ➝ Name of the class. 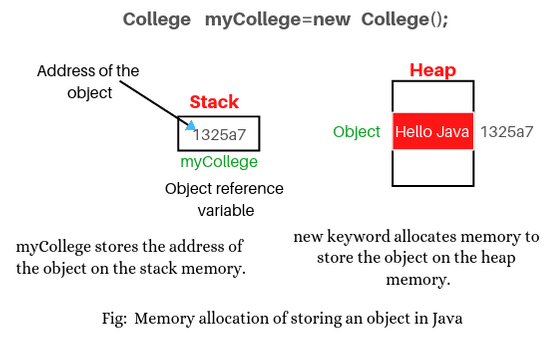 myCollege ➝ Object reference variable which stores the address of the object in the stack memory. new ➝ keyword that stores the object in the heap memory. College() ➝ Constructor of the class. = ➝ The equal sign(=) is an assignment operator. It simply says to take the object created by new keyword and assign it to the object reference variable. Let's understand the memory allocation for storing an object in Java. When the statement College myCollege=new College(); will be executed by JVM, an object will be created in the heap memory and stores the data "Hello Java" in it. The address of the object is stored in the reference variable myCollege in the stack memory. Remember that creating an object means allocating memory for storing data. You can also create an object of the class in two steps like this. Step 1: College myCollege; // Declaration of reference to the object. Step 2: myCollege=new College(); // Creating an object. Both reference variables have different memory addresses. Student st=new Student(); // It will call default constructor. School sc=new School("DEEP"); // It will call Parameterized constructor. Let's see a very simple program step by step to understand the concept. Output: Hello Java Welcome to online Java tutorial point. You follow all the above steps to make your program easy and keep all steps in mind. 1. System is a class which is predefined by Sun Microsystem. 2. out is a variable declared in System class of type PrintStream. 3. println is a method defined in PrintStream class. The void is a keyword which indicates that this method does not provide or return any data back to the class of an object. Now let's take one more example for practice. Program source code 2: In this program, we will calculate the sum of two numbers. you follow all the above steps. If you are a beginner and unable to understand this program then you go for the next tutorial. You can easily understand after the next tutorial. We hope that this article has covered all the important topics related to How to create an object in Java for example and programs. Hope that you will have enjoyed this article. We always try to understand you in an easy way.